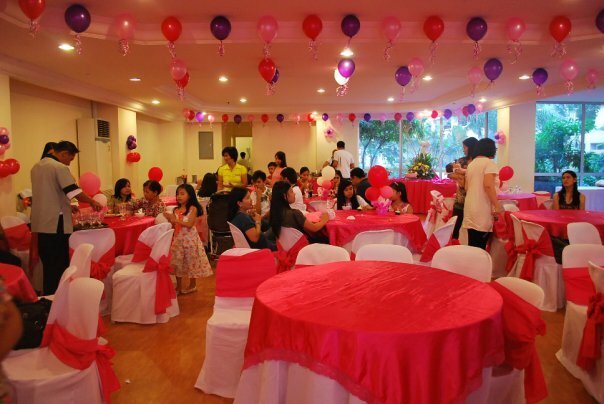 Looking for a party venue for your kid’s birthday is exciting and tiring at the same time. I had my fair share of this experience when I personally planned my daughter’s baptismal and 1st birthday celebration almost 4 years ago. To help you moms, dads and even newbie party planners in finding the perfect party place to celebrate children’s party, I made and sorted list of venues that you may want to consider. a) The Convention Hall – can accommodate 150 to 200 people, seated. This is best for intimate parties and events when you have limited guests. The place is easy to dress-up depending on client’s theme and budget. b) The Ballroom – can accommodate 350 to 450 people. With its old-world charm, the venue can be transformed from simple to whimsical. It’s flexible to decorate. The mezzanine can add drama to the set-up while a ready platform sets the stage for the program. Air-conditioning guarantees comfort for all the guests. Light of Love Events Place is situated in Quezon City and is nestled with exotic trees, blooms, lagoon and waterfalls. It has 6 venues you can choose from depending on your party’s desired theme and number of expected guests. The venues are named Love, Trust, Loyalty, Integrity, Cherish and the Atrium. Water Nymph Resort Ballroom is fully-air conditioned with high ceiling. It has a chandelier at the center enclosed with glass doors where you can have a better view of the landscape and the garden pool. The venue is equipped with high quality basic sound system and with an elevated stage. Pictured above was my daughter’s baptismal reception years ago at the ballroom of Marquinton Residences, Barcelona Tower. Both function halls require P5,000.00 security deposit which will be refunded after the event. hi im having a party thats needs to 350 pax but i want a biger space in metro manila .. anything suggestion ?